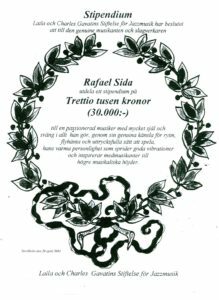 Den genuine musikanten och slagverkaren Rafael Sida tilldelades 2004 ett stipendium från Laila och Charles Gavatins Stiftelse för Jazzmusik med motiveringen: "Till en passionerad musiker med mycket själ och sväng i allt han gör, genom sin genuina känsla för rytm, flyhänta och uttrycksfulla sätt att spela, hans varma personlighet som sprider goda vibrationer och inspirerar medmusikanter till högre musikaliska höjder." Percussionist Rafael Sida was born in Mexico but Sweden has been his home for the last twenty-five years and he has collaborated with such groups as Hot Salsa, Makonde, Amadu Jarr¹s Highlife orchestra and Erik Steen's Flamenco Fusion. He is a musician with a passion for all he does providing soul and groove to his musical environments whether they be salsa, flamenco or different kinds of African music. He is a also a much-appreciated teacher and through his wide experience has modelled his own drum set which is a combination of a conventional jazz kit and a collection of ethno percussion instruments. His favourite among masters of the art is the late Sabu Martinez. Because of his prowess as a percussionist as well as his personal charm Rafael is a great favourite among his colleagues. On the CD "Jonas Knutsson Quartet" (TMcCD 018) he demonstrates his abilities using sticks, brushes and hands. 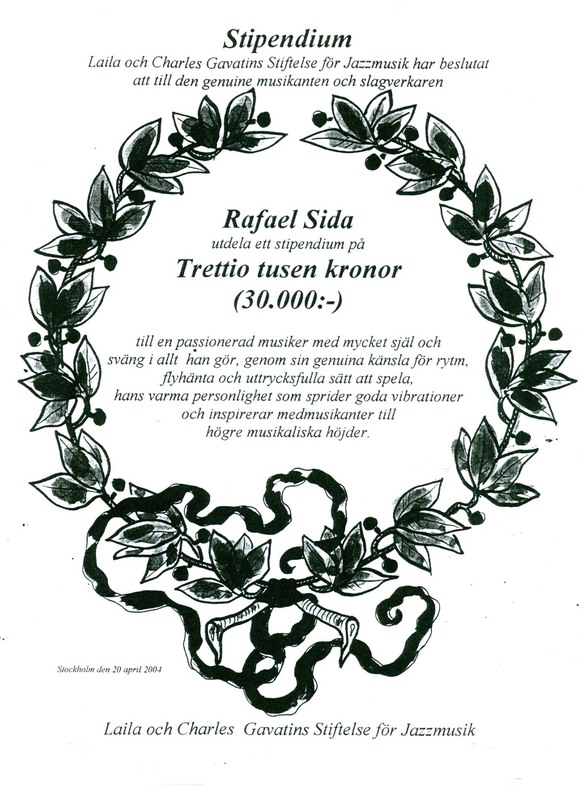 In 2004 Rafael Sida received a scholarship from Laila and Charles Gavatin's Foundation for Jazz Music.